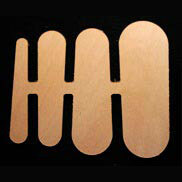 These fillet sticks are accurately cut from 4mm Okoume plywood to making perfect fillets. They range from 1-1/8" to 1/4" radius. Makes a great gift for a boat building buddy that has everything. For a PDF file containing instructions by Russell Brown on how to use these fillet sticks, click HERE.